LifeCoin Review: Sweatcoin Or LifeCoin? Last updated on March 7, 2019 By Nat Leave a Comment This post may contain affiliate links. We appreciate you supporting Rags To Niches! Full disclosure here. I recently discovered Sweatcoin, an App that pays you in points for walking – points you can switch up for rewards. So, I was surprised to find this incredibly similar App while browsing the app-store. I promptly downloaded it, to see just how close the similarities to Sweatcoin really were – was this App any better? What is LifeCoin & How Much Is It? How does LifeCoin Pay ? Beyond Apps, Alternative Ways To Make Money. LifeCoin tracks all of your steps outside… Whether you be walking, running, or hiking! You get paid in “LifeCoins,” for the steps that you take and you can exchange these for real rewards. You can also refer friends and family to sign up, for 5 additional LifeCoins each…. (Although, considering a $50 gift card is 2500 points, you’d need to refer a LOT of people for that to help you). Lifecoin is free to initially download, but you can pay more if you wish to make more coins. So, in order to get paid 10 Lifecoins a day, you’d need to pay for their premium membership. I’m in the UK and the premium membership is £34.99 per year, or $39.99 in the US. This premium membership seems pointless to me? By contrast, Sweatcoin also have various different premium memberships. The difference with Sweatcoins memberships is, that you purely pay in Sweatcoin and not with cash! The key problem with Sweatcoin for me personally, was that there weren’t enough worthwhile rewards, (I believe this is different in the US). LifeCoin do have some decent gift card options – but they were all in US dollars and so, I’m not sure how that works for people outside of the US. There’s not much point in me getting an Uber voucher that can only be used in the US! How Do You Get Started With LifeCoin? You can simply download LifeCoin quickly from the App store or Google Play. It’s a nice looking, slick App and once you have uploaded it and opened it up, you’ll be shown what steps to take next. You’ll need to confirm your mobile number, they will text you a code you must key in. You can then start earning LifeCoin right away by walking outside. LifeCoin won’t measure the steps you take inside… Only outdoor steps are meant to count. (Although, it has measured some of mine that have been inside now and again… somehow…). You can then start the slow process of accumulating points and for every 1000 steps you take outside, you will get one Lifecoin. This is the same with Sweatcoin as well. However, it’s not an exact science. Lifecoin is for anyone who wants a bit of extra motivation to get out and walk and start to get more active. Or for anyone who perhaps already walks a fair amount and wants to track their steps for extra potential rewards. It’s not for people who are just trying to earn gift cards or rewards, because it’s such a slow process to be able to accumulate that many Lifecoins. Related: My Top 10 Best Survey Sites USA, OR Top 10 UK! LifeCoin will give you credits in their own online virtual currency – “LifeCoin,” and these are coins you will, (eventually) be able to exchange for rewards. Rewards range from technological items, such as headphones, (see below) to much more expensive tech items and gift cards. My Experience With LifeCoin – Vs Sweatcoin? My experience with this App has been eerily similar to Sweatcoin. Right up to the overall design of the App, there isn’t too much to differentiate between them. However, there are several key differences that stood out to me between the two and one of those things, is a total deal breaker. Firstly; With Sweatcoin, I’m able to reach different levels of daily coins – by purchasing higher levels with Sweatcoin, (not cash). So, I can pay a certain amount of Sweatcoins each month, to be able to earn more per day. Whereas with LifeCoin, I have to pay for this in actual cash and it still only allows me to earn 10 coins per day max!!! Secondly…. One of the perks for Lifecoin, (for me) was there seemed to be more lower-cost rewards available, (with Sweatcoin, I didn’t have gift cards available in the UK!). But unfortunately all those gift cards are UK based. Thirdly… While both platforms have a referral program and pay 5 coins per sign up…. Sweatcoin have an extended program for people who refer over 30 people; which gives them access to additional rewards and perks. On it’s own – a referral program that only pays 5 coins, probably isn’t going to be worth it for most people. Especially people who would be interested in recommending a platform on a larger scale and have a big reach. While Sweatcoin drains battery faster than usual… Lifecoin personally appeared to drain it way faster! But with LifeCoin, my phone went from 90% to zero percent battery in around 30 minutes. This also caused the additional problem, that I couldn’t then record my steps anyway, because my phone was off! The real deal breaker for me?! … Is having to PAY for the premium membership in cash, rather than their virtual coin. LifeCoin has some pretty good feedback from others online. 4.7 stars and well over 3000 ratings on the App store right now, which is very good. On Google play right now, LifeCoin has 4 stars, an less than 300 ratings right now. Some people have complained that the App has stopped counting steps. One review stated that they felt the tracking on LifeCoin was actually better than Sweatcoin, but that the bigger prizes are hard to get. Encouraging you to do something that’s healthy, for rewards. Possibly get rewards for something you do every day anyway… (walk!). Plenty of different rewards, which will change over time. Earn 5 coins per friend/family member that signs up. Nice looking App, easy to navigate. This App can very quickly drain your battery. There isn’t an FAQ on the app itself, I’d like to see more information online at the very least. You have to pay in cash, to access their premium membership, (but this does not seem worthwhile). Even with the premium membership, it would take you a very long time to redeem anything. There is a cap of 10 LifeCoins a day, with the premium membership. Some people think the app can be easily fooled/isn’t accurate. If you’re downloading the app purely to earn rewards, you’ll probably be disappointed! While they do have a referral program – with Sweatcoin, you can unlock influencer rewards once you have referred 30. Some people have complained about customer service/not having emails returned. LifeCoin is a legitimate App that works in a very similar way to Sweatcoin. Which App you prefer, is going to be dependent on various factors. For one, your location will determine what sort of rewards may be available to you – so, you may want to check both out. Which app you prefer, may also will depend on how far you walk regularly. 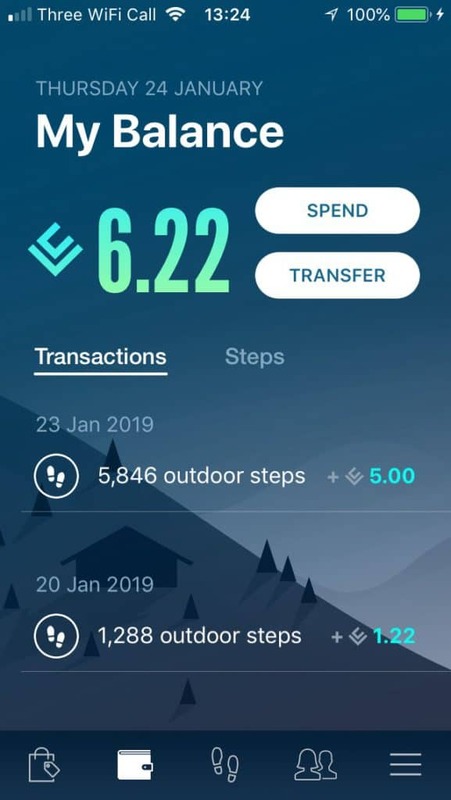 If you’re a massive walker, then you’re better off being with Sweatcoin at the present time, because you can join higher levels to earn more coins. Another thing that may influence your decision, is the referral program. Because, If you have a blog, large social media following, or YouTube channel and can generate 30+ referrals, you can unlock further rewards. Ultimately, Apps like this are unlikely going to make you very much money. For the most part, make-money Apps can help you to make or save a very small amount of money – a few dollars here and there. But if you’re really hoping to make more of a part-time, or full-time income online, there is so much more you could do. I wrote a list here showing a tonne of different ways you could start making money. The key is, you do need to learn some skills! But that is so much better in the long term, because these are skills that can earn you money long into the future. For me, I make the most from having my own website and I make money via paid advertising and affiliate marketing. I hope you found my Lifecoin review useful! If you’d like to share your experience with this App, you’re welcome to leave a comment below!